I have heard people say that when someone asks them for a double portion that they feel sorry for them because of all that they had gone through to attain to the “level” of revelation and anointing that they are walking in. In one sense I feel that the term “double portion” is overused and abused. Many go from place to place and from minister to minister asking them all for double of what the minister is walking in. The attitude, however, is not entirely wrong, that desire to “share” in the same Spirit another has with the Lord. As the Body of Christ, this kind of fellowship (as written in Ephesians 4:4) is vital to our growing together and become one body in one Spirit. What Is a Double Portion? So what’s the big deal? It’s a matter of spiritual realism. We can’t give something we don’t have, naturally or spiritually, and we can’t impart a double anointing - that is entirely up to God. So, this passage does not refer to someone laying hands on you and you instantly receiving twice as much anointing as the person praying for you. No, this is about a share of Spiritual inheritance issued directly from the Father. Instead of one share, Elisha wanted double – the right of a firstborn. So what does this “share” consist of? What was Elisha to receive as an inheritance, besides an old robe? Elijah grants Elisha one last wish. His request is bold - a “double share” of Elijah’s spirit. The “double share” is one more portion than is normally distributed. The phrasing is odd because “double share” refers to something quantifiable, but Elijah asked for ‘rûah’ - the energy and authority of Elijah, none of which is quantifiable. Elisha asked to be invested with Elijah’s power as a prophet. So Elisha’s request is an inheritance in the Spirit. He wanted a double share of that which was on Elijah as an inheritance, the same way a firstborn son would receive a double share of the natural inheritance. 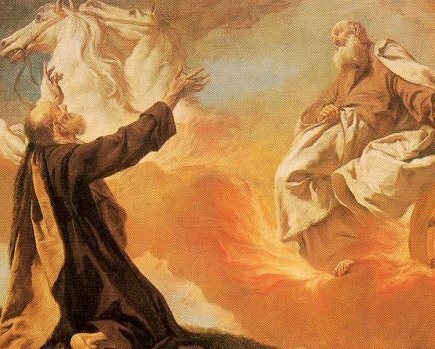 The significance is that Elisha receiving Elijah’s mantle made him the new prophetic voice to Israel, walking in even greater power than Elijah himself! It follows that if Elijah couldn’t give something greater–or twice as much as he had to Elisha–then how was this possible? Because Elisha experienced Elijah’s ministry and relationship with God, and then he began his own, coupled with the fulfilled promise from God to bestow the double portion - compounding the effect! Just as it took a lifetime for Elijah to come to the place where he was taken to heaven–a lifetime to attain to that “level” of revelation – it was vital for Elisha to see him and experience that revelation with him, so Elisha could start where Elijah left off. Elijah’s ministry culminated with the same revelation that began Elisha’s ministry. If we see him when he leaves we will start where he left off, just as the disciples did with Jesus. The point is that though we may not be able to receive double portion anointings from people we can receive revelations in which they have spent their lives for and apply that knowledge and revelation to our lives. Instead of starting over for ourselves, we start at the level they leave at. I believe that this is the reason the spirit of Elijah is coming again in the last days. The Father’s heart is for generation to raise up generation to raise up generation. Revivals often stop because the generations are at odds with each other. This leaves the rebellious younger generation starting over instead of picking up where the stubborn older generation left off. When the generations finally come together, the world will shake. Imagine an entire generation of Elijahs raising up an entire generation of Elishas! I reconsidered these things because recently when Cathie and I prayed for the healing of a woman with ovarian cancer, we both received instant confirmation and then the Lord gave Cathie an immediate prophetic word for the woman, telling her how God was going to use her to do things in the Spirit in her home country of Jamaica. Others have been placed there of course but she would go after them and apply what she experienced in a new way – and bring thousands to God. This opened up my spirit to new revelation on the transfer between Elijah and Elisha. That the one who reads it may run." What is the double portion anointing? It is the fact that we inherit what previous generations had, and then we can add that to our own anointing - like pouring fuel on a fire. This is exactly what God had written in Deuteronomy 28:1-13 and exactly what He has done with me in the past year – I have spiritually inherited my mother’s ministry in the Spirit. The disciples saw Jesus ascend to heaven and were instructed to go to Jerusalem and wait for the baptism of the Holy Spirit. They were to await their mantle. The same way that Elijah left Elisha his mantle, Jesus was sending the Holy Spirit to His disciples. Just as the revelation did not leave with Elijah, it did not leave with Jesus either. They both left their mantles to the next generation. What the disciples spent the last few years of their lives watching Jesus do, He was now calling and empowering them to do. And not only that, He was calling them to do even greater things, because now they would have full capacity to relate to him in the Holy Spirit and not just physically. Their foundation, their starting place was everything they had seen Jesus do. They were to inherit a double portion as well. This was the platform for them to start their ministry. This was the platform for them to impact the Earth. I believe that everything we discussed gives us awesome insight into understanding the verses that I want to leave us with. These verses in Ephesians encompass everything I have tried to share in this article.